78 out of 78 (100.00%) customers would recommend this product to a friend. Shopped around and they had the best prices by far. I've ordered several times from Ink technologies. The products are always as advertised and a great value for the product -- considerably less than the manufacturer's cartridge! And I cannot tell a difference in the print quality. Was not certain the cartridge would work in my laser printer. Very impressed with the comparability & quality of print. Found this company on internet looking for the best price available. Thank goodness I found them. I needed to speak with someone once and they are so very nice and easy to work with. Products work wonderfully and they are quick to deliver. I would recommend this company to everyone needing supplies for printers. I love it!! The best for the price!! Works perfect will buy again. Will order again. My order arrived quickly. good value, works as advertised, recommended. Repurchasing for our school. Saves us money. The toner does exactly what is supposed to do! Toner cartridges came just as expected. Delivered on time and the pricing was really great too. Since I must pay for my classroom printer's toner cartridges, I'm very pleased with the price I pay out of pocket for this school supply. Why buy new when you can get these for a third of the price. Seems like a no-brainer! I have been purchasing these cartridges for about a year now. They work great for our needs and the price is so much more economical for the many print jobs we run. The cartridge worked perfectly and lasted a very long time. The cartridge performed as well as the original HP product and is an excellent value. Wonderful price, best service, thank you for being there. Product worked as advertised, zero issues out of all of the several I have purchased. Great quality. Works just as it would if it were a new cartridge. Only took a couple of days to receive my product. A great value and good quality. I've purchased at least 6 of these in black and about 9 in the three main colors for a color printer. This has worked great in our color printer. A lot less expensive and works the same as HP brand. Overall the process for ordering and timely shipping were great. Product came with no defects or damage during shipping. Really love the ease of ordering and the price is great. Excellent Service and prompt shipping. Good website for ordering printer cartridges. Like all Ink Technologies products, this toner prints perfect quality, and is sold for an outstanding price. This cartridge lasted a very long time... over 5 months. I have never had a problem with any product I have ordered from Ink Technologies. I would recommend Ink Techologies to anyone. I have ordered multiple times and never have had any problems. The remanufactured products works like brand new. They offer a good product at a great price. They also offer recycling of old printer cartridges which helps saves more junk in the landfill. Works like it should. The color is great. No complications putting the cartridge where it belongs. We are a non-profit school for deaf children, and cost savings and convenience are very important to us. InkTechnologies has become our supplier of choice. Quick, easy to order, comes right to our door, good quality at a great price. The products purchased are a good value for the price, and the quality of the ink is excellent. This cartridge lasts for several months at our company. The color is always rich and vibrant! Definitely like this product and will continue buying. This product is well priced and works just as good as the manufacturer's toner. I could not be happier. Good value for the price, shipping is fast. This is my second order. I am totally satisfied with everything. They are very efficient, everything works well as it should, and the prices are a fraction of what HP ink costs. I have no hesitation in highly recommending this company, their products and their service. I've never had to follow up on anything. I'm not blowing smoke, but everything has been stellar. I have used many ink products over the years. When you buy discount it usually means you are not getting good quality, but this product is great, no leaking, no streaking, no problem with compatibility. Much less than HP originals in cost and they work well. Every time we order ink cartridges they arrive quickly, they are easy to install and if there happens to be an issue with one, the return process is simple! Have been ordering these products for years now and will continue to order in the future. Great alternative to buying HP original toner! Can always depend on this product. Like its protective packaging. Would recommend to friends using my type printer. Very good indeed. Quality is excellent. Service is very prompt. The laser cartridges seem as good as HP's. But why can't the Chinese hire some one who speaks and writes English well? Such folks are hardly difficult to find in the U.S. The instructions are pretty much worthless except for the good laugh they provide. It couldn't cost more than $100 to have someone rewrite the instructions. I'll volunteer. I don't have a degree in English, but my wife does. I'll have her check my work. We are retired school and university educators. Remanufactured cartridges have always printed well but this last order seemed to not last as long as the previous purchases. Have found more economical sources online but I stay with Inktechnologies as they have always provided good tech services. Purchased this toner for our new business printer. Saved us money off retail and did a great job- indistinguishable from a full-priced cartridge. No problems working in HP Printer. Print quality is good. Ink Tech products are a terrific value!! Ink is great for the price. Much better than purchasing manufacturers product. Works and looks great, costs way less. What is not to like? Great product, prints perfect every time. Can't believe how great the savings compared to the store. I've never experienced issues with this website, nor your products. It's refreshing! For the money, this is great. The print quality is a little light. I have been a customer of Ink Technologies for more than 4 years and they have not failed in assisting to get my job done, especially when my schedule is always hectic. High quality printing, great price and works just as well as OEM ink without the high price. It gives us quality print for the money we have spent. 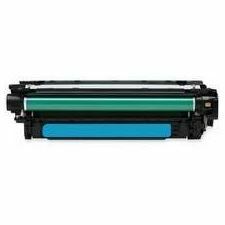 The remanufactured HP Toner Cartridge performs the same as the higher priced HP OEM cartridge. It earns my five star rating for both performance and price! A perfect match and a significant savings over OEM, works seamlessly. Highly recommend this product. Magenta, Yellow, Cyan and Black. I could not rate all sections lower than excellent because, quality, value for price, print quality and Ink Technologies as a Vendor is top drawer. Just as good as an original HP toner cartridge. Was under 2600 prints but not a huge difference. Will order more. Cartridge performs like OEM at a much lower price. I bought a CE411A toner 13 months ago and used it. No problem everyday. Order arrived in a timely manner and the package was intact. Would recommend to other businesses. Very comparable to other refurbished ink. I'm sticking with ink technologies because of reward program. Very satisfied. Excellent quality and value. Print quality matches that of the name brands and the price is a fraction of the cost. I always order ink from Ink Technologies; great ink, great prices. I love when I'm able to find promo codes and coupons. I would recommend this product to other business owners. Good price and quick delivery good quality. Rec'd product promptly. Quality of print good; page yield was not quite as expected. This cartridge provided excellent color coverage for my printer. Service & delivery were very fast. This is the second time I have purchased this Cyan replacement toner cartridge for my HP Laser M475. Both times the cartridges have performed very well, which is why I bought the second cartridge and why I can recommend the purchase of this replacement cartridge. Excellent coverage and print quality. Very good product and price.